To kickoff Rocktober (aka my birthday month! ), I've decided to start my blog! This has been a long time coming, but October 1st brought such a flood of inspiration that I knew it was time to venture into the sphere o' blog at last! 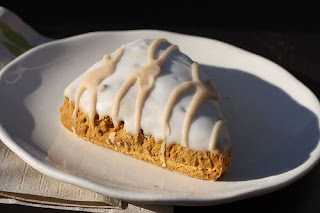 October 1st also brought something magical back into play: the pumpkin scone from Starbucks! If you don't know about this amazing frosted breakfast treat, then HURRY to your nearest Starbucks and load up! It was an obsession of mine when I was 21-22, and then like so many other favorites of mine, it was gone. So support the cause and show that mermaid toting franchise that we need sugary goodness all throughout the year! I love us and pumpkin!!! Oh, and Grey and I went to a wine bar in downtown Culver City last night that I am now DYING to take you too, and they had a pumpkin cheesecake that I want us to try together!